Learn from professional guides. Southern Appalachian Anglers offers a truly, one-of-a-kind, Southern Appalachia fly fishing class in Asheville, North Carolina. The fly fishing class covers a variety of local fly fishing techniques from small creeks to big rivers, fly selection, WNC fly hatches, reel mechanics, fish patterns and more! Our experienced fishing instructors have taught hundreds of people how to fish throughout the years. While learning to fish with our knowledgeable instructors, SAA students will learn everything from casting technique, choosing the right tackle, reading the water, essential knots, to year round pattern selection, fly selection, line essentials to proper fish release and more. All schools are based on availability and must be booked in advanced. Call (828) 691-1506 to make your reservation. 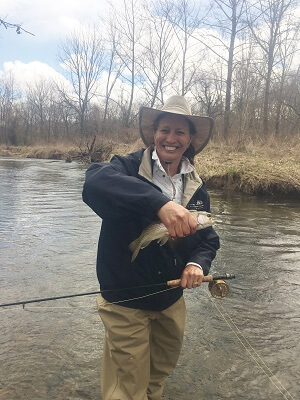 Choose our fly fishing class in Asheville, NC to learn more about the art of fly fishing and how to catch fish on the fly! Includes instruction, lunch & all equipment.